Note: A list of related websites is included at the end of this story. 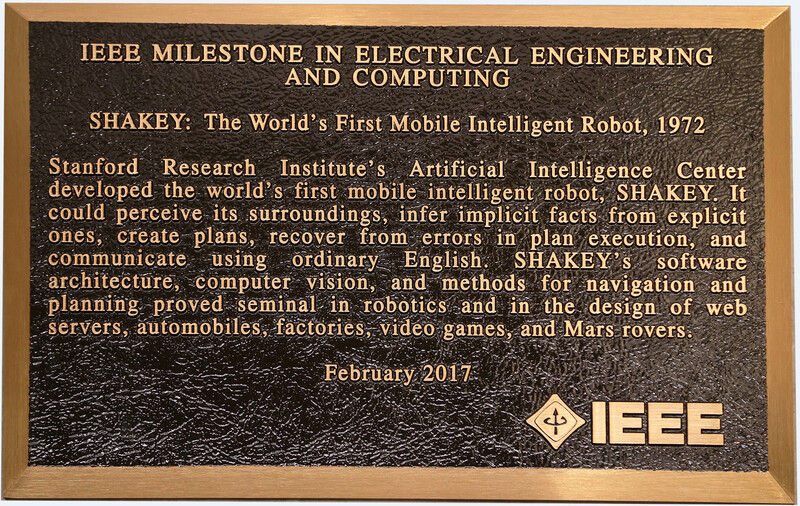 SHAKEY the Robot was honored with the 174th IEEE Milestone. Its dedication took place on Feb. 16, 2017 (full video here), at the Computer History Museum (CHM) in Mountain View, CA USA. The IEEE Milestone program honors significant technical achievements in areas related to electrical engineering and computing. 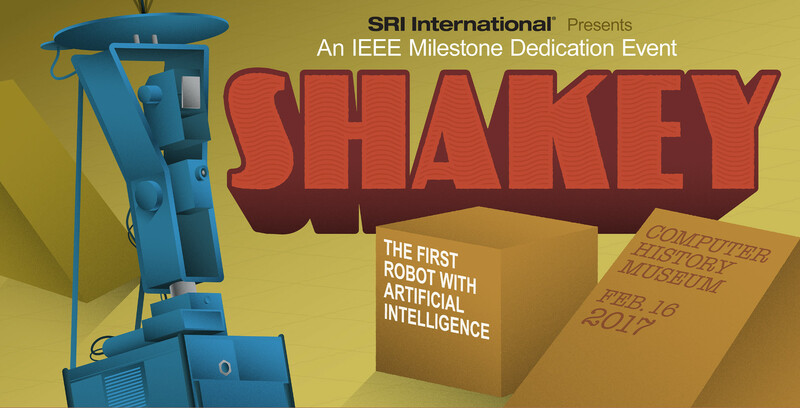 SHAKEY was created from 1966-72 by the Artificial Intelligence Center at Stanford Research Institute (now SRI International). This 12″ x 18″ bronze Milestone plaque is mounted at the Computer History Museum, and another will be in the lobby of SRI International in Menlo Park, CA. Photo by SRI International. SHAKEY was the world’s first robot to embody artificial intelligence. It could perceive its surroundings, logically deduce implicit facts from explicit ones, navigate from place to place, make a plan to achieve a goal, monitor the execution of a plan in the real world, recover from errors in plan execution, improve its planning abilities through learning, and communicate in simple English. Although SHAKEY’S 50-year old hardware design and computational resources are primitive by today’s standards, its software architecture and algorithms created a legacy that influences more than just the design of today’s robots. When your phone computes driving directions, when your car warns that you’re veering out of your lane, when a character moves in a video game, and when the Curiosity Rover autonomously navigates around obstacles on the Martian surface – techniques first developed for SHAKEY are being used. 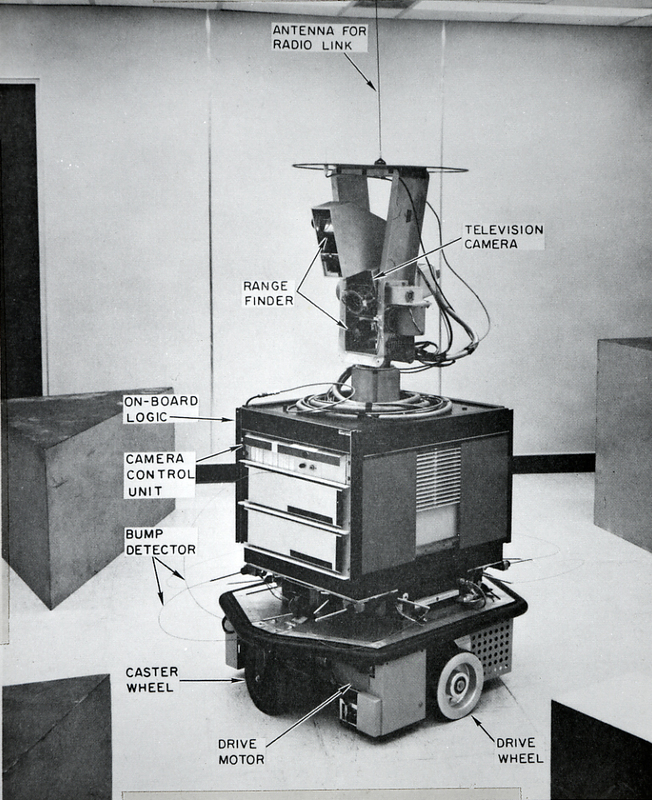 SHAKEY in 1972, with its primary components labeled and when it used an antenna as its radio link to a DEC PDP-10 mainframe computer. Photo by SRI International. SHAKEY looked bulky enough to contain a lot of computing power, but its on-board electronics were only for local control of sensors and motors and for communicating with a time-shared mainframe computer. That computer was an SDS 940 until around 1970, after which a more powerful DEC PDP-10 was used. A cabled harness at the top of SHAKEY was the initial computer connection, and this was later upgraded to a radio link using an antenna. 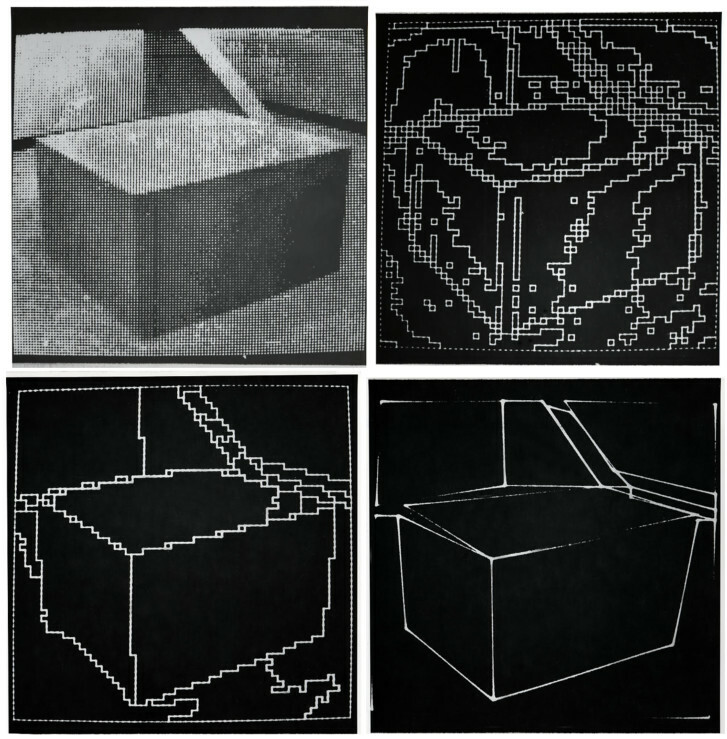 Images showing SHAKEY’s visual perception capabilities using a region-analysis method developed by SHAKEY design team members Claude Brice and Claude Fennema: (1) an array of pixels from a digitized TV image, (2) the pixels grouped into regions, (3) similar regions merged, and (4) lines fit to resulting boundaries and shapes, which are thereby recognized as a cube, wedge, floor, wall, etc. Images and descriptions from SHAKEY design team members Claude Fennema and Richard Duda. SHAKEY’s computer vision software extracted regions and lines from TV images captured by its camera. As shown in the sample set of four images above, regions were used by the region-analysis methodology to “perceive” SHAKEY’s surroundings. Navigating to a desired location used planning software to generate a route based on a series of steps, with correct completion of each step performed by analyzing the TV image of SHAKEY’s current location as compared with a model of its surroundings. Charlie Rosen and SHAKEY, in a photo used in a November 1970 LIFE magazine story. Photo by Ralph Crane/Time Life Pictures/Getty Images. The SHAKEY project was initiated by Dr. Charles A. Rosen, known to everyone as “Charlie.” He was a one-of-a-kind polymath who had founded a radio company in Canada, co-authored the world’s first textbook on transistors, built one of the world’s first learning machines, and co-founded one of California’s earliest and most famous boutique wineries (Ridge Vinyards). In addition to being an intellectual omnivore, Charlie possessed three key traits that were essential to his success in starting the Shakey project: he was imbued with a spirit of adventure, he was relentlessly persevering, and he was fearless in the face of opposition. The dedication was held at the Computer History Museum’s 400-seat Hahn Auditorium, and the room was full for this important event. 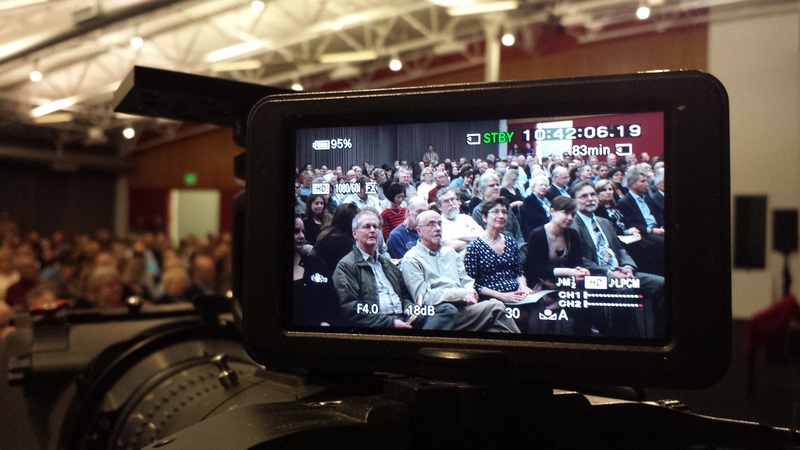 The 400-seat Hahn Auditorium as viewed from the camera operated by Ken Pyle of Viodi. Many attendees were from companies and universities that worked in the robotics, artificial intelligence and automotive fields, including employees or alumni from SRI, Savioke and SMP Robotics, and students and faculty from Stanford University. In addition, at least one-third of those in attendance were IEEE members. CHM Board Chair Len Shustek and IEEE President Elect Jim Jefferies both spoke early in the program. Photos by Douglas Fairbairn Photography. 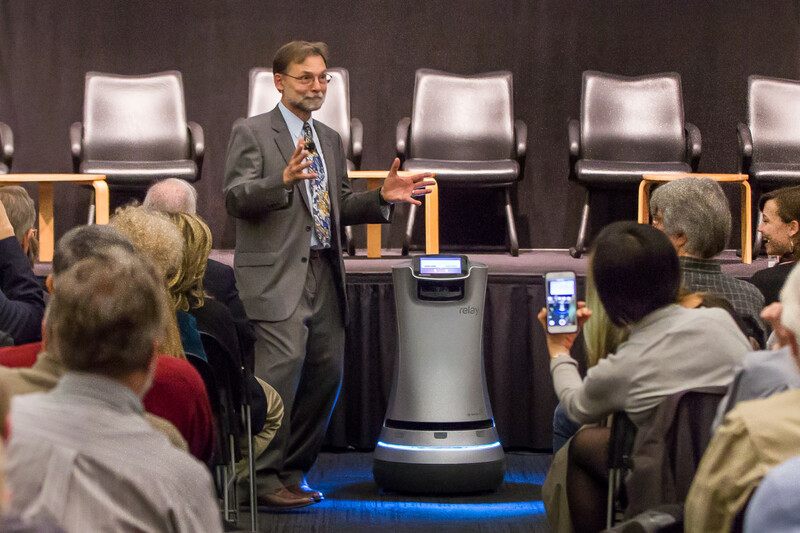 CHM Board Chair Len Shustek started the evening’s program with his recollections of learning about SHAKEY the Robot in one of his first graduate school classes at Stanford University. IEEE President Elect Jim Jefferies then provided some background about IEEE as well as about its Milestone program. The Savioke Relay robot makes a delivery to event organizer and IEEE Region 6 Milestone Coordinator Brian Berg. Photo by Douglas Fairbairn Photography. There was a fun segment early in the program when the Savioke Relay robot made a delivery at the front of the audience to IEEE Region 6 Milestone Coordinator Brian Berg, who had organized the Milestone dedication event. Brian explained that Relay is the “grandson” of SHAKEY and that it thereby includes “SHAKEY’s DNA.” This is based on Savioke founder and dedication event participant Dr. Steve Cousins having studied SHAKEY’s seminal algorithms during his schooling, and that some of these algorithms were used by the PR2 and TurtleBot robots he helped design at Willow Garage. PR2 and TurtleBot were thus the “sons” of SHAKEY. 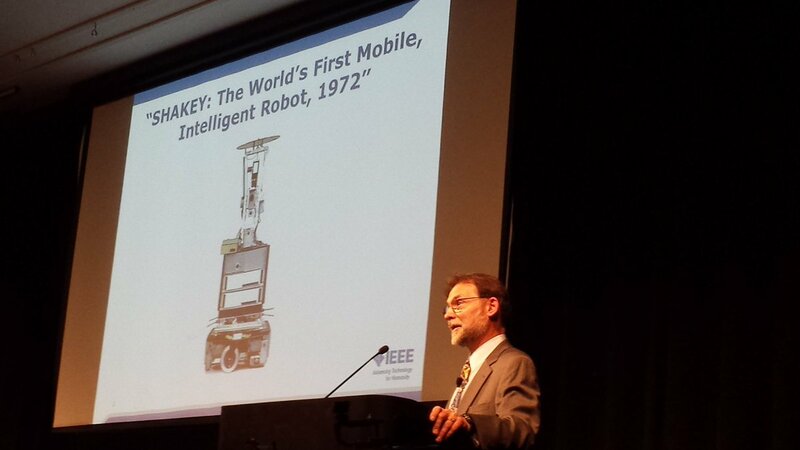 Brian Berg explains how SHAKEY was accepted by the IEEE History Committee as the “world’s first” mobile, intelligent robot. Photo by Ken Pyle of Viodi. Brian Berg then discussed the IEEE History Committee‘s approval of a Milestone for SHAKEY, and that it was the first Milestone in the fields of robotics and artificial intelligence. The Milestone’s title is “SHAKEY: The World’s First Mobile Intelligent Robot, 1972,” and justifying this “world’s first” descriptor was an important part of the approval process. Brian explained that SHAKEY design team Leader Dr. Peter Hart had provided him with a robustly documented description of SHAKEY that was used for the Milestone proposal as submitted to the IEEE History Committee, and that this description included the indisputable basis for this “world’s first” designation. 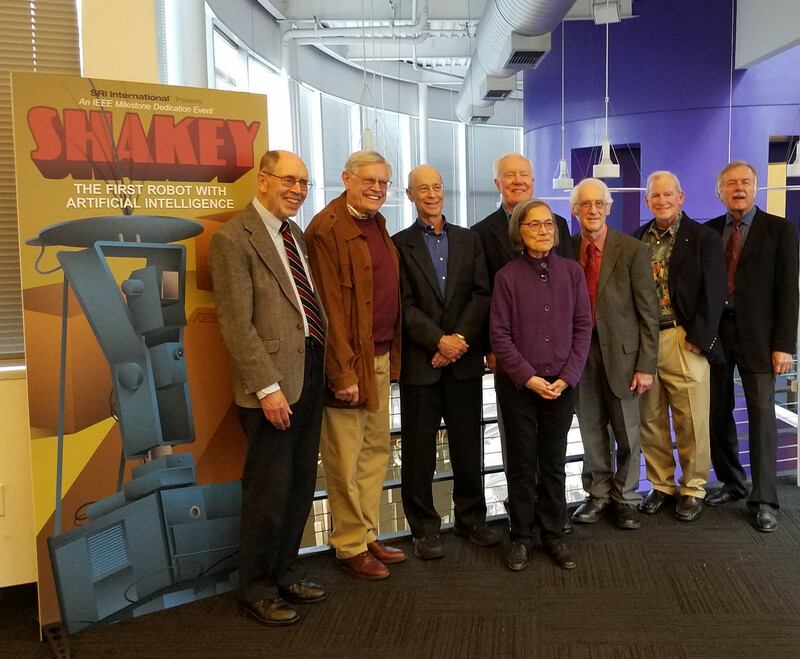 SHAKEY design team members posed with a special poster made for this event: Richard O. Duda, Claude Fennema, Peter Hart, Nils Nilsson, Helen Chan Wolf, Mike Wilber, Tom Garvey and Richard Fikes. Photo by Brian Berg. During his presentation, Brian introduced the nine members of the original SHAKEY design team who were in attendance at the event (the eight pictured above, along with Bertram Raphael). The above 5-minute video which summarizes the story of SHAKEY’s creation and its impact on the world was then shown. Produced by SRI, and including interviews with SHAKEY design team members and others, this video provided a foundation for the remainder of the evening program’s discussion. 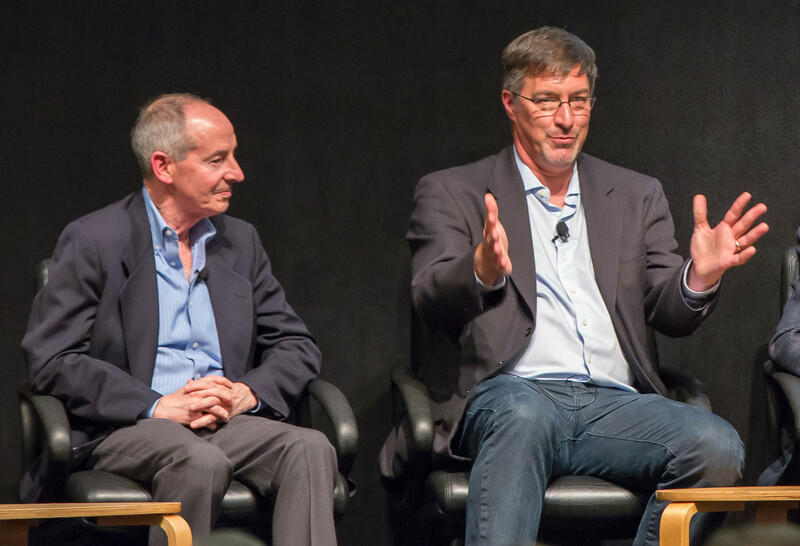 Peter Hart and Nils Nilsson discuss the creation of SHAKEY with John Markoff. Photo by Douglas Fairbairn Photography. 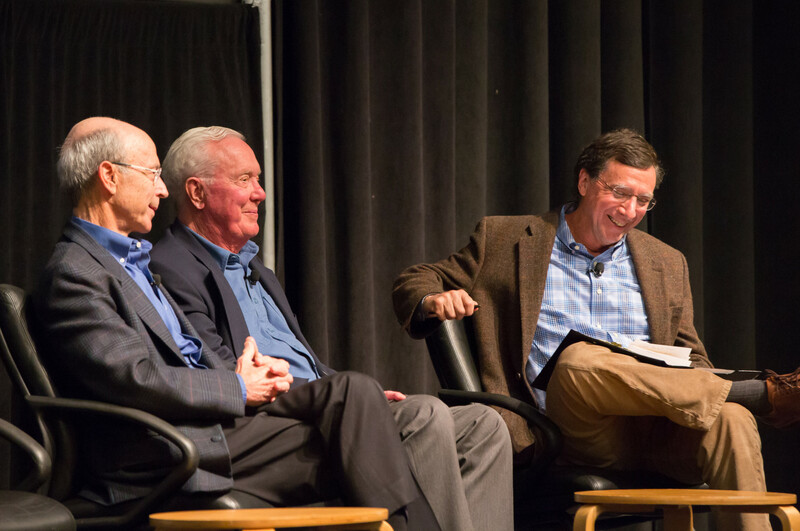 The dedication event featured an on-stage conversation moderated by John Markoff, Computer History Museum historian and former technology writer at the New York Times who is also an author and winner of the 2013 Pulitzer Prize. Markoff first interviewed original Shakey design team members Drs. Peter Hart and Nils Nilsson about the story of Shakey’s creation. Matt Heverly explains how the Mars rovers explore the Martin surface (video excerpt here) by using techniques that evolved directly from those created for SHAKEY. Photo by Douglas Fairbairn Photography. 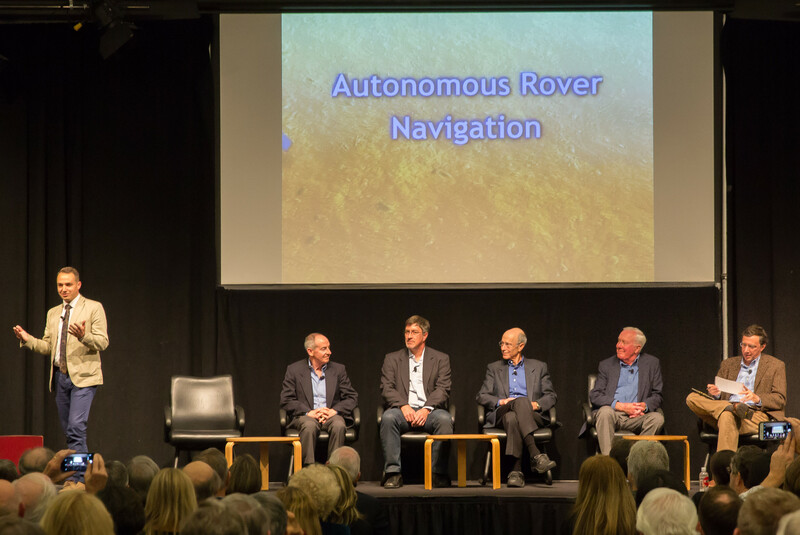 John Markoff then explored Shakey’s legacy with Matthew Heverly, Mars Rover Driver at NASA’s Jet Propulsion Laboratory (JPL). While a NASA video was playing, Heverly explained how Mars Rovers are able to autonomously navigate the varied terrain of the Martian surface using techniques that evolved directly from SHAKEY’s seminal A* Shortest Path Algorithm. This fascinating portion of the program is excerpted here, and this technique is described in depth in this Journal of Field Robotics paper. SRI’s Bill Mark and Savioke’s Steve Cousins in conversation with John Markoff. John Markoff continued the conversation with Dr. Steve Cousins, CEO of robotics companies Willow Garage and Savioke, who discussed how Shakey’s “DNA” is embedded in robots he created at both start-ups. SRI’s Dr. Bill Mark described fundamental issues raised by SHAKEY that are still on the frontiers of research. All five of the participants fielded questions from the audience for the remainder of the evening’s conversation, and a link to an IEEE Spectrum story detailing this discussion is included below. IEEE Region 6 Milestone Coordinator Brian Berg and IEEE President Elect Jim Jefferies unveil the bronze plaque that will be installed in the SRI lobby in Menlo Park, CA. Photo by Douglas Fairbairn Photography. 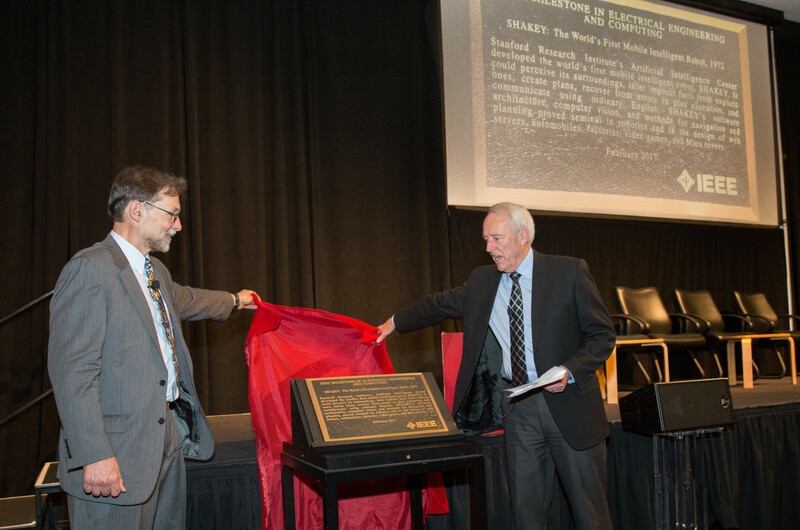 The evening’s program was concluded with the unveiling of the Milestone bronze plaque by IEEE Region 6 Milestone Coordinator Brian Berg and IEEE President Elect Jim Jefferies. 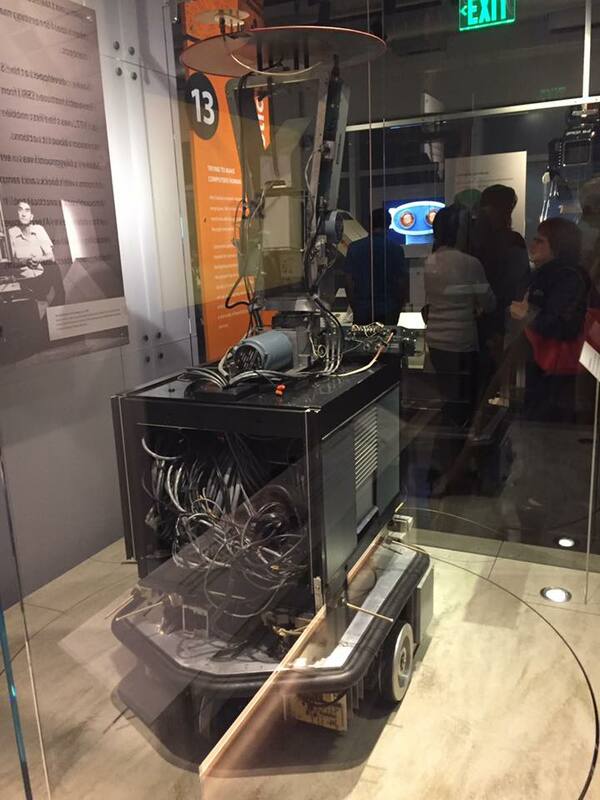 SHAKEY, the centerpiece of the AI & Robotics section of the Computer History Museum’s Revolution Exhibition, as viewed after the dedication. Photo by Natalia Baklitskaya. Event attendees were then invited to see SHAKEY in the Revolution exhibition on the lower floor of the museum. Post-Event Comments from Brian Berg: I would like to acknowledge the excellent assistance of SRI International in helping to fund most of this event, and its staff with whom I worked closely – in particular, Dina Basin who was my main point of contact, and Nick Davila for his work in creating a very professional special video. In addition, Savioke, Nissan Research Center – Silicon Valley and SMP Robotics all made significant contributions in funding the event, and Savioke brought their Relay robot as well. Thanks to Ken Pyle of Viodi and of the IEEE Silicon Valley Tech History Committee for providing additional camera work. 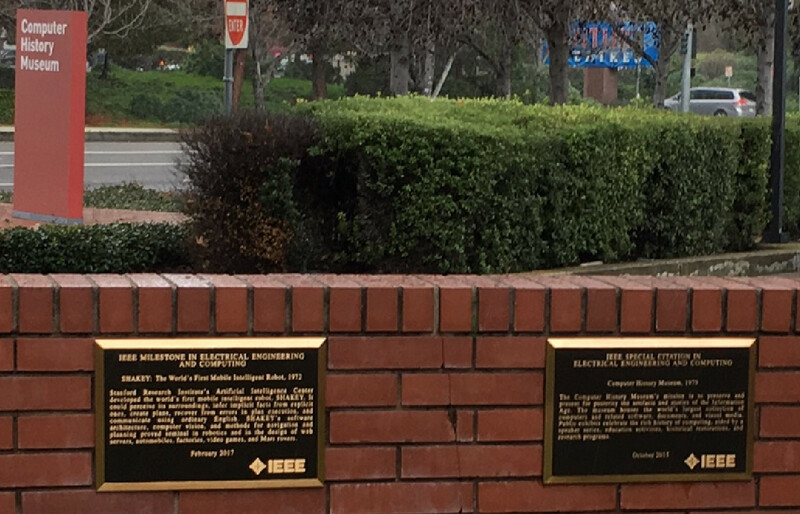 Thanks also to the Computer History Museum for its valuable relationship with IEEE, and to the IEEE Santa Clara Valley Section for funding the bronze Milestone plaque that will be installed in the lobby of SRI in Menlo Park, CA. Finally, I am personally proud to have donated the second bronze Milestone plaque that now resides on the brick wall near the front entrance to the museum (see below). If you have any suggestions for IEEE Milestones, please see the criteria as described here. A chronological list of the Milestones dedicated since 1977 is here. Contact me at [email protected] if you have any questions, additions and/or corrections about this website, or about IEEE Milestones. A SHAKEY Milestone bronze plaque is to the left of the Computer History Museum’s Special Citation bronze plaque near the front entry to the museum. The primary SHAKEY plaque will be in the SRI front lobby in Menlo Park, CA. Photo by Computer History Museum. Brian Berg has been a data storage technologist for over 30 years through his Berg Software Design consultancy. His current specialty is flash memory as used in consumer electronics and enterprise applications, and he works extensively with patents and intellectual property. 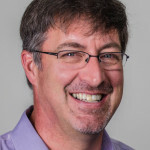 Brian is Technical Chair of Flash Memory Summit, and he has organized, chaired and spoken at over 100 technology conferences and events including at the Computer History Museum. Brian has a long record as an IEEE officer and volunteer in the Santa Clara Valley Section, including as Section Chair as well as Chair of the IEEE Consultants’ Network of Silicon Valley. 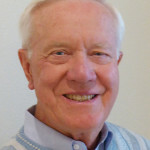 As IEEE Milestone Coordinator for the western US, he has secured Milestones for EEPROM/Flash Memory, the Apple Macintosh and SHAKEY, and he helped oversee Milestones for CP/M, Moore’s Law, and the Apple I and II. He is a CHM Core Member, has a Bachelors in Mathematics from Pacific Lutheran University, and has been a Computer Engineering graduate student at Stanford University. Jim Jefferies is 2017 IEEE President Elect. 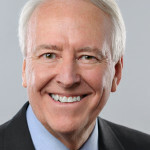 He is a retired AT&T and Lucent Technologies executive who in 33 years rose from manufacturing engineer to Vice President. He worked directly with the Bell Labs teams that developed fiber optic cables, and also served as logistics Vice President responsible for worldwide supply chains, quality assurance, and export planning. More recently Jim teamed with fellow Stanford Business School graduates in an entrepreneurial venture in San Francisco for which he served as COO. While he was 2015 IEEE-USA President, Jim supported expanded focus on public visibility, young professionals and humanitarian outreach. He earned his BSEE from the University of Nebraska, an MSES from Clarkson University, and is a licensed PE (Emeritus). Jim attended the Stanford University Business School as a Sloan Fellow, earning an MS in Management. 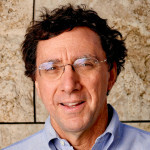 John Markoff is internationally recognized for his in-depth reporting and expertise in technology and science, having covered both subjects for nearly three decades. As technology writer for the New York Times, he was winner of the 2013 Pulitzer Prize. In his new role as historian at the Museum, he will focus on writing, research, and moderating live programming. 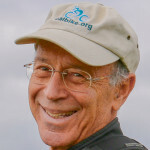 Markoff has written two books that offer a unique perspective on computer history, including What the Dormouse Said: How the Sixties Counterculture Shaped the Personal Computer Industry in 2005 and Machines of Loving Grace: The Quest for Common Ground between Humans and Robots in 2015. SHAKEY plays an important role in the latter’s chronicle of robotics history. Peter E. Hart has founded or led a half dozen companies and international research centers, and has co-invented or developed the theory of some of today’s most widely-used algorithms. Most recently he was Senior VP of Ricoh Company, Ltd. (Tokyo), the first westerner to serve as a Ricoh corporate officer. While at SRI International, he worked on SHAKEY for the entirety of its 1966-72 development, including as its Project Leader. Dr. Hart’s technical writings have been cited over 85,000 times. According to Google Scholar, this makes him the world’s most-cited Robotics author, and among the top ten most-cited Computer Science authors. Peter holds over 125 patents covering a wide range of artificial intelligence and software inventions. He is a Fellow of the IEEE, the Association for Computing Machinery, the Association for the Advancement of Artificial Intelligence, and the Rensselaer Alumni Association, and is also a member of the SRI Hall of Fame. Nils J. Nilsson, Kumagai Professor of Engineering (Emeritus) in the Dept. of Computer Science at Stanford University, received his Ph.D in EE from Stanford. He spent 23 years at SRI International’s Artificial Intelligence Center working on statistical and neural-network approaches to pattern recognition, and co-directing work on SHAKEY. As part of the SHAKEY project, he co-invented the A* Shortest Path Algorithm and the STRIPS automatic planning system. 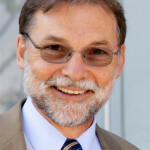 In 1985, he joined Stanford as Chairman of its Department of Computer Science, and taught courses in artificial intelligence and machine learning as well as doing robotics research. 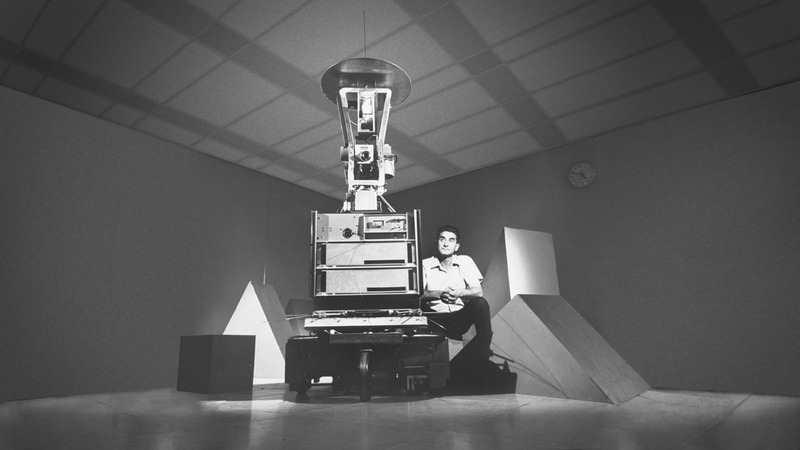 During his career, Nils published five textbooks on artificial intelligence. He is now retired and lives in Oregon. Nils is also a Member of the SRI Hall of Fame. About the speaker, Steve Cousins of Savioke, Inc.
Steve Cousins has been designing and building robots for over 25 years. As founder and CEO of Savioke, he’s currently developing and deploying Relay – an autonomous delivery robot that works in human environments. Steve was previously President and CEO of robotics incubator Willow Garage where he helped create the widely-used open source robot operating system (ROS) and the PR2 and TurtleBot “personal robots.” SHAKEY’s Shortest Path Algorithm is in the “DNA” of Relay, PR2 and TurtleBot. Steve has been an executive at IBM’s Almaden Research Center and at Xerox PARC, and is active in the Robots for Humanity project. Steve’s Ph.D is from Stanford University, and his BS and MS computer science degrees are from Washington University. He also earned a micro-MBA while at IBM. William Mark leads SRI International’s Information and Computing Sciences Division, which creates new technology in information security, system design, speech and natural language, vision and perception, planning and reasoning, and formal methods. The group’s leading-edge research is complemented by a strong focus on intellectual property creation and commercialization. Projects include Internet interaction, intrusion detection software, physical and virtual information spaces, and technology for dynamic enterprise management. 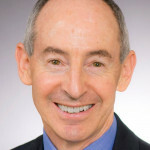 Prior to joining SRI in 1998, Dr. Mark headed the System Technology Group at National Semiconductor, and was the director of Information and Computing Sciences for the Lockheed Martin Palo Alto Research Laboratories. Before joining Lockheed, he was a co-founder of Savoir, a company developing software tools for flexible manufacturing. He also held positions at the University of Southern California Information Sciences Institute and the General Motors Research Laboratories. Matt Heverly has worked at Pasadena’s Jet Propulsion Laboratory since 2005. As the lead driver for the Mars Curiosity rover during the first three years of its mission, he directed the rover to navigate to locations unseen by humans by making use of the rover’s autonomy – which is a direct descendent of SHAKEY’s A* Shortest Path Algorithm. 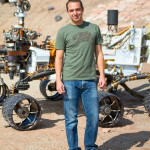 Matt’s JPL work has also included driving the Opportunity Mars rover, robotics research, and developing the mobility system for the rover that will go to Mars in 2020. He has a Bachelors in Mechanical Engineering from Cal Poly San Luis Obispo, and a Masters in Robotics from Boston University.